Meticulously crafted using reclaimed and sustainably harvested woods, the Morgan console brings a sense of history to any space. 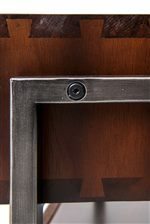 Antiqued mirror panels in the doors give the piece a rustic elegance, while the splayed legs touch on mid-century modern design. Four doors provide an abundance of storage space perfect for your dining room or living room. The Bina Morgan Console with 4 Doors by Four Hands at Story & Lee Furniture in the Leoma, Lawrenceburg TN and Florence, Athens, Decatur, Huntsville AL area. Product availability may vary. Contact us for the most current availability on this product. Finish Brown finish with varying tones. Case Construction Sustainability harvested and reclaimed woods. 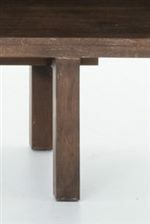 Step out of the ordinary and create a modern and rustic space in your home with the Bina Collection. 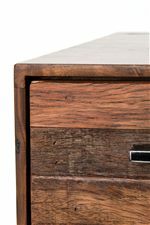 The beauty of reclaimed wood gives you unique, one of a kind pieces that tells a story. Dark metals have been introduced to pieces adding an industrial touch. Amazing storage options seen though out the Bina Collection not only gives you style but adds function. Mix and match pieces making it true to your style and home. The Bina collection is a great option if you are looking for Contemporary furniture in the Leoma, Lawrenceburg TN and Florence, Athens, Decatur, Huntsville AL area. Browse other items in the Bina collection from Story & Lee Furniture in the Leoma, Lawrenceburg TN and Florence, Athens, Decatur, Huntsville AL area.